There are people in this church today whose presence would have been unthinkable only a generation ago," noted Fr Michael Canny in his homily yesterday. A former American President. The Chief Constable of the Police Service of Northern Ireland. And the leader of the DUP. Bill Clinton was probably the most high-profile mourner in terms of that trio. His appearance was warmly applauded. But Mr Clinton only had to travel 3,300 miles to get there. Arlene Foster had to traverse our long and bloody history of division, hatred, fear and suspicion. And her own very personal history of hurt. She hesitated just a little as she reached her pew near the front of the gloriously ornate St Columba's church, a small smile acknowledging the heartfelt applause that had greeted her entrance. 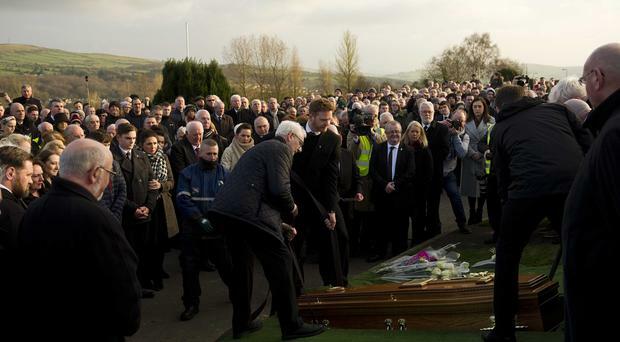 A warm moment between mourners and the woman who worked alongside Mr McGuinness at the head of the Executive - and whose political difficulties were, ironically, magnified by his decision to resign. A warm moment - but possibly a fleeting one. For Arlene Foster will have known as she set out yesterday morning to attend that funeral service that she'd be damned if she did, damned if she didn't. Stay away, and she would be Arlene the Arrogant. A jibe that has come not just from her republican critics, but from some much closer to DUP headquarters. Attend, and she would take the inevitable flak not just from the extremists in her own party but - and this is the difficult bit - from the relatives of victims of IRA savagery for whom the eulogising for Martin McGuinness is just more bitter salt rubbed in the wounds. Arlene Foster, as she took her seat yesterday before the tricolour-draped coffin of the one-time IRA commander, will have been only too acutely aware of how those people would be feeling. For she too is a relative of a victim of IRA savagery. When she was a child her policeman father was shot and wounded by the Provos. She remembers seeing him "dancing about" to try to avoid the bullets. Until a bullet hit him in the head ... He survived. But what impact on a little girl of eight years to watch such horror? To then hide, terrified and weeping in her bedroom as distress flares lit up the sky around their isolated home and she and her family waited for help to arrive? When the man who she believes carried out that attack on her father died, his funeral oration was delivered by Martin McGuinness. Such, the cramped space of our divided history. But John Kelly, like his daughter, was a public servant. A man who put duty first and did the right thing. And yesterday, Arlene Foster did the right thing. She is leader of the largest unionist party here, the former First Minister of Northern Ireland and the Stormont colleague of Mr McGuinness himself, and of other republican and nationalist politicians who will feel his loss. On all these counts it was the right thing to do. As Her Majesty the Queen has shown, it requires courage and grace, but gestures of respect and reconciliation move us all forward. Mrs Foster wasn't the only representative of the Protestant unionist community at the service. A number of other unionist politicians, including former DUP leader, Peter Robinson, were also in the congregation. Presbyterian minister the Rev David Latimer was one of the main speakers from the pulpit. Mr Latimer, who bears a certain facial resemblance to Coronation Street's Jim McDonald, spoke with genuine affection about the Martin McGuinness he regarded as a dear friend. "At some point in future I'm looking forward ... to praising God with him in Heaven," he said - with a cleric's assurance in his own celestial afterlife. Bill Clinton, whiter and slimmer and frailer than in the days of peace processing, but still with that charisma and that way with words, recognised the enormity of Arlene Foster's attendance. "I know your life has been marked in painful ways by the Troubles," is how he put it simply. He made the congregation laugh with quips about Gerry Adams and about Martin McGuinness's relationship with Ian Paisley. "It was great he got a word in edgeways - I never could." He ended with praise for the deceased and an exhortation. "If you want to continue his legacy, go and finish the work he has started." And then, as the congregation were filing out, another small moment of outreach. Michelle O'Neill, leader of Sinn Fein at Stormont stretching out to grasp Arlene Foster's hand. And even in amid the shuffling bustle of the other mourners leaving down the church aisle, you could sense the genuine warmth of the exchange. There was much talk yesterday, there has been all week, of Martin McGuinness's remarkable journey. Yesterday as his family and his friends carried him on his final journey, Arlene Foster chose to do the right thing and to go and pay her respects. From the little girl cowering in terror in her family home through to the woman who became the leader of unionism and then, the First Minister of Northern Ireland, that was a pretty momentous journey too.